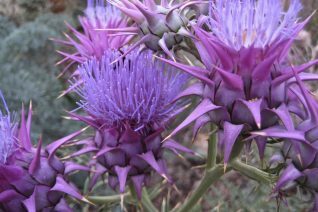 Cardoon. 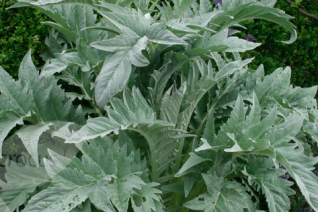 Big ol artichoke cousin that has amazing architectural bold, silver leaves that are up to 30″ long and half as wide. Forms a large rosette (4′ across) initially then the stem extends rising to 4′ tall bearing huge rich, violet blue flowers that are up to 5″ across held in a cylindrical calyx. Open call to all pollinators. Blooms begin in the second year in May and repeat to August. Full sun, rich, well drained soil with light summer water. Give it room to spread out horizontally because it inevitably will. Light deer resistance. Beautiful perennial in all of its parts. Lifespan (3-5 years ) on average. Fancy and beyond showy ornamental thistle/cardoon. Finely divided silver foliage lines a stem that elongates to bear multiple large violet blue flowers. The calyx (the mechanism that holds the flower (s)) is nothing more than fiercely and lethally armed with razor sharp spikes. They will cut you . Be careful. The violet blue and lower down, pink flowers are host to every pollinator in the neighborhood, Monarch Butterflies, Hummingbirds and even the post person is drawn to this remarkable flower. To 28″ tall for full sun and rich, well drained soil. Drainage must be sharp. Light summer water. Appreciates a hot position. Moderate deer resistance. Winter deciduous. N. Africa.